I'm a new guy here. 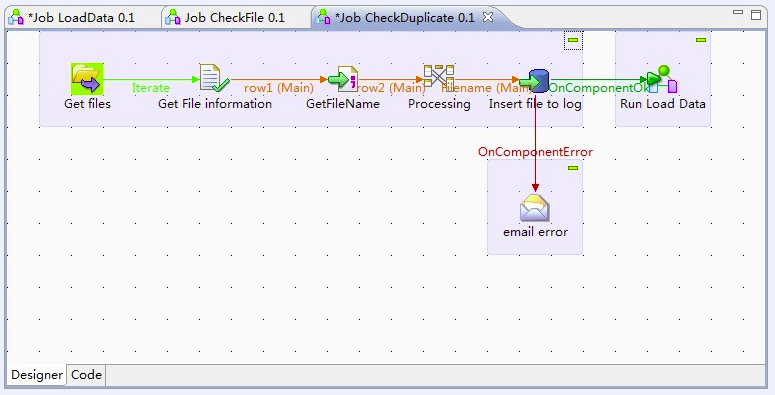 Talend is so cool tools. Using Talend as the ETL solution, read the files from the ftp site and load the data to a local database with following features. · Process can run only if all 10 files are available. · Notification of success and failure of job along with Job log. · Propose a quality report for daily data load. I did some research and successfully downloaded file from FTP server by using tFTPconnection, tFTPlist and tFTPget. But I cannot find any tutorial about the file operation. Could you give me a hand about the following questions(Bold)? I don't need the detail about this assignment. Please tell me what kind of palettes(tFileList,etc) I can use for this assignment. >> In order to do this, you will have to create a lookup table for successfully loading files, use tMap and inner join with the incoming file name variable above which can be stored in context variable as well. Process can run only if all 10 files are available. Notification of success and failure of job along with Job log. Propose a quality report for daily data load. Thank you very much. I will carefully read your post! I tried my best. Does this works? log is the tablet that I used for storing the file name. You will have to use RunIf clause to execute your subjob based on 10 files which you need.. But you are on the right track..